Before there was Bordeaux, before Champagne, Burgundy and, of course, California, there was Italy. 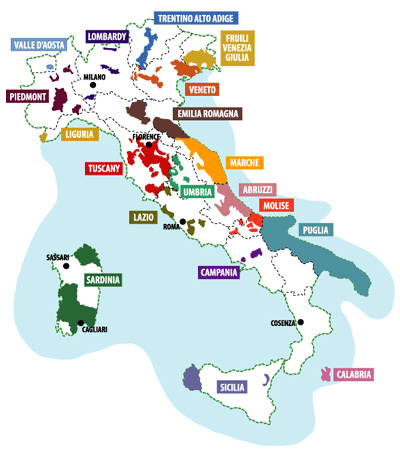 Famous regions like Tuscany and Umbria, surrounded by Piedmont in the northwest, Veneto and Fruili in the northeast and the isles of Sicily and Sardinia have been producing great wines for centuries. regions including the two islands and boast 1.7 million acres under vine. maintaining the centuries old family winery business. The shear thought of viewing, smelling, oxidizing, re-smelling, tasting and spitting these faultless wines before lunch was exciting and surreal. With the wines neatly arranged on an informative napkin before me, I knew I was up to the task. Institute of Master of Wine, located in the United Kingdom. Its decree is regarded as the highest standard of knowledge in the wine industry. Subsequent to the submittal of essays, tasting and securing a Master of Wine mentor, one may enter the arduous, three-year program that is completed when the candidate successfully submits four theoretical papers and three blind tastings within the same year. 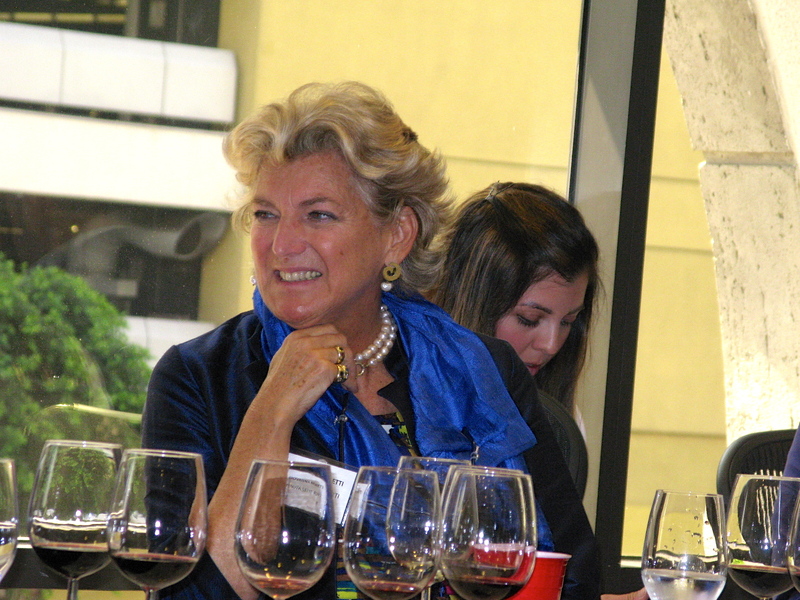 Ms. Simonetti-Bryan shared that her final exam blind tastings involved the identification of 38 wines from terroir throughout the world. 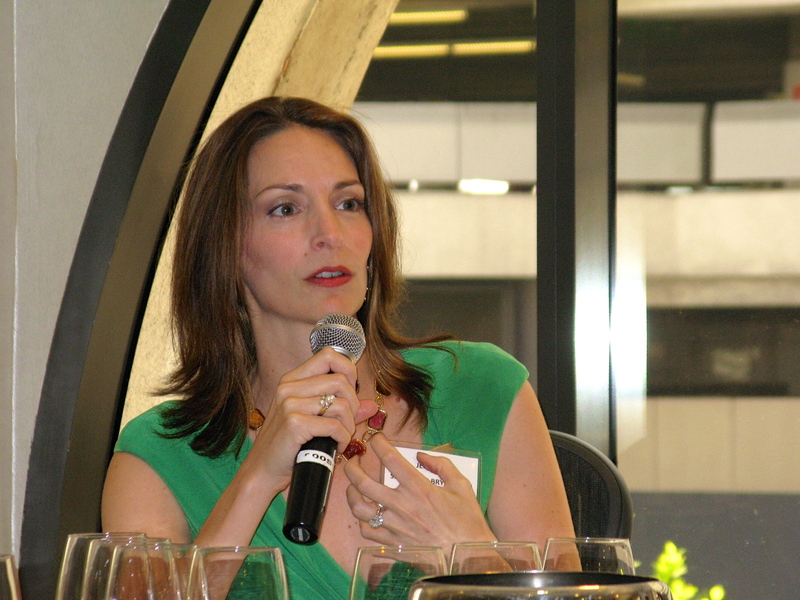 Another young woman was introduced as the newest Master of Wine designee, the 10th U.S. female to achieve the honor. Described by some as the world’s best terroir for pinot grigio, Collio is among the finest production areas in the northeast Fruili-Venezia Giulia region. 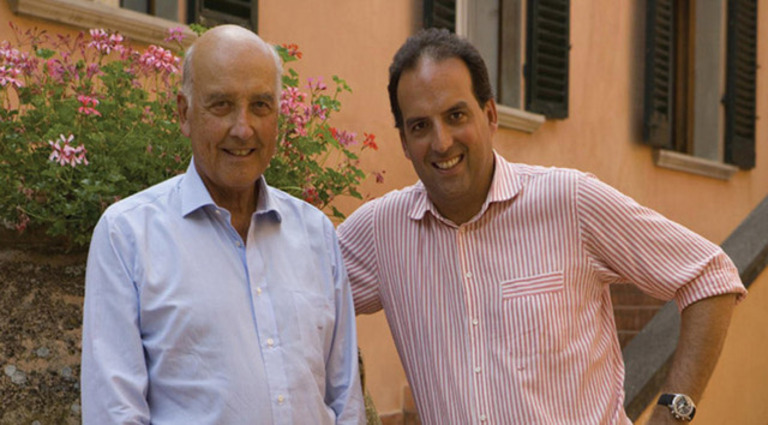 The Pighin Family acquired the sandy soil, 30-hectares near the town of Spessa di Capriva, in the late 60’s and has since fashioned quality red and white wines. 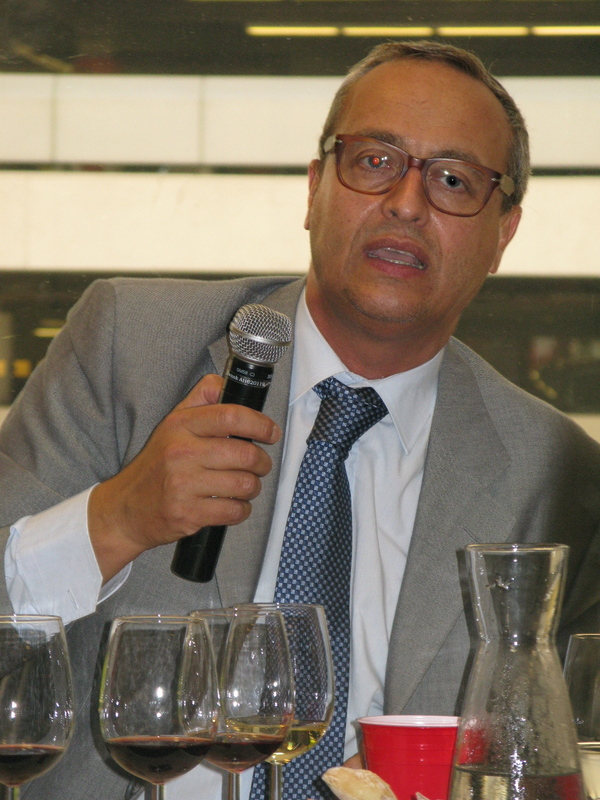 Family representative Roberto Pighin informed us that the Pinot Grigio Collio D.O.C. 2012 was fermented and aged in stainless steel vats (oak free) to retain the crisp, acidity of the wine. The captivating straw yellow color of the wine foreshadows what’s to come. With citrus and stone fruits on the nose and palate, the wine delivers a nice minerality with balanced acidity that enhances the softer, rich flavors. in the U.S. This wine is perfect with various seafood and vegetarian dishes. Barolo ,a Denominazione di Origine Controllata Garantita D.O.C.G., guaranteeing origin, is a wine grown in the northwestern region of Piedmont. As sangiovese is the grape of the Tuscan Chianti, Barolo is made from nebbiolo or “the foggy one.” The Cerequio Barolo D.O.C. is an exceptional example of single vineyard Barolo. The Langhe is a hilly region in Piedmont with highly calcareous soils. At 1,200 ft. elevation, the Cerequio Vineyard is called the “balcony of the Langhe” with contents of magnesium in the soil. Aged for two years in oak, there is a nice spice on the nose and the balanced tannins provide a full-bodied richness throughout a long finish. This wine is pairing well with red meats in hard cheeses such as pecorino-reggiano. 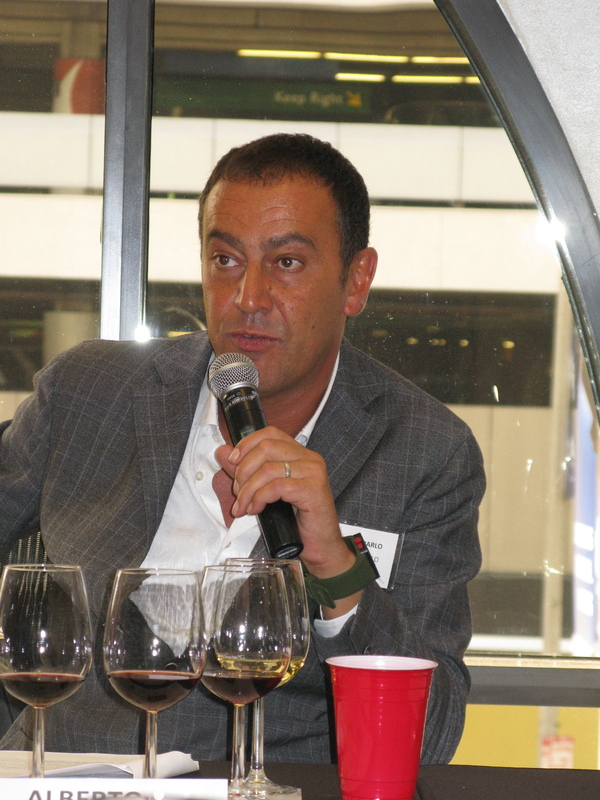 The name Brunello Montalcino alone gets the attention of serious wine drinkers. It identifies a wine produced in legendary vineyards surrounding the town of Montalcino, south of Florence in the Tuscany region. Low-yield vines, a warm growing season and strict viticulture practices allow the sangiovese grape in Montalcino, specifically, the Manachiara Vineyard, to fully ripen. 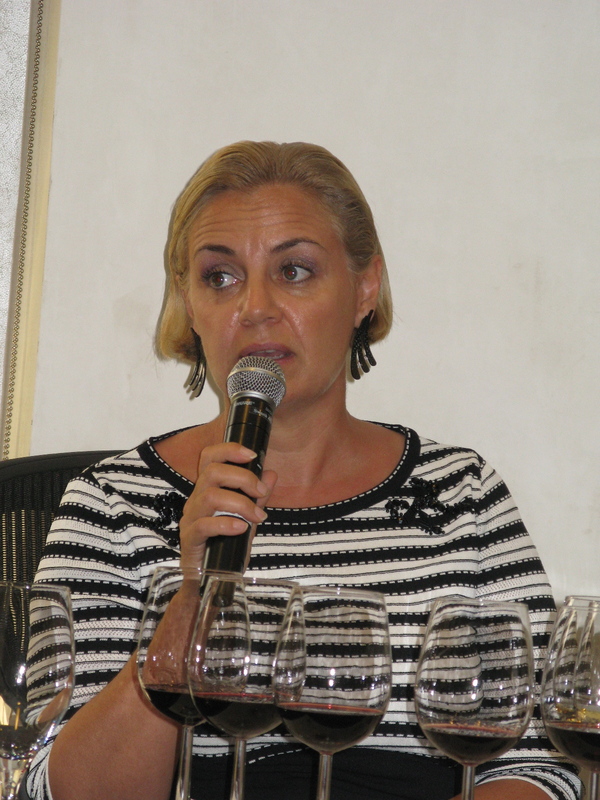 President Emilia Nardi explained that the “Manachiara” endures a lengthy maceration process, leaching tannins, color and flavor compounds from the skins and stems of the grape into a “must”. The juice matures for nearly three years in oak barrels and another in the bottle. The result is a ruby red wine with a clear spice component on the nose. The flavors, as with all wines at this tasting, are rich and full with the acidity and tannins precisely in balance. This is a wonderful, earthy wine from a legendary plot in Tuscany. A pairing with roasted lamb is one from heaven. In the 1940’s Marchese Mario Incisa della Rocchetta settled in Bolgheri along the Tuscan coast. 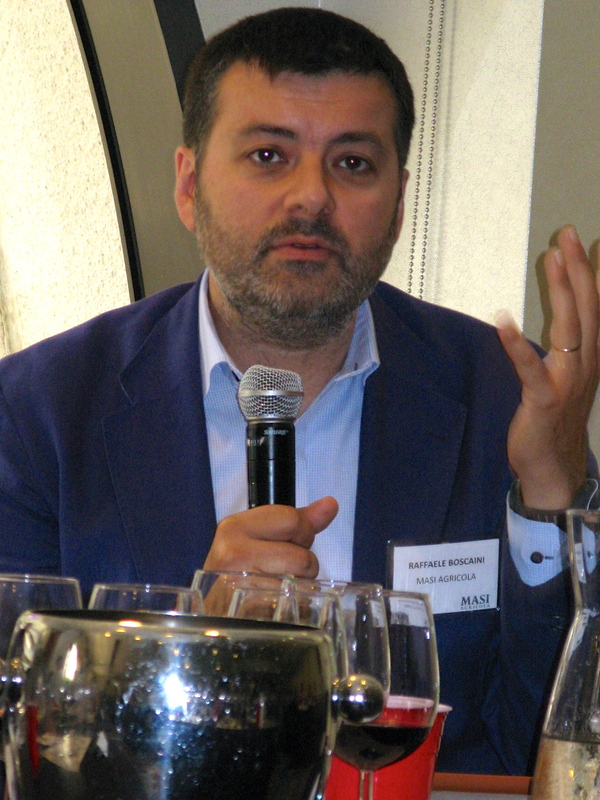 Contrary to local Chianti winemaking tradition, Rocchetta imported cabernet sauvignon grapes from Bordeaux and established a vineyard he called Tenuta San Guido. He also aged his wine in French barriques instead of customary Slovenian casks. French grapes in Tuscan soil. In fact, Sassicaia means “the place of many stones,” aptly describing local soils that produce a unique minerality. Piero Incisa della Rocchette, a third generation winemaker, sees this wine not as a large “fruit bomb,” but a well-balanced wine using neutral oak, allowing the incredible terroir to take over. aromas of dark fruits and spice, rich elegant flavors with soft tannins and a long finish. 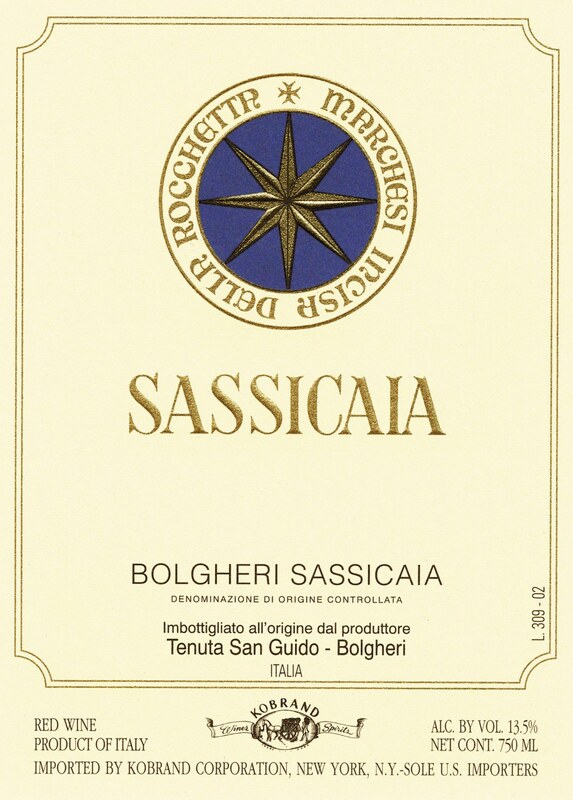 Debuting as the first Super Tuscan in 1968, their success led to Bolgheri Sassicaia D.O.C., becoming its own appellation in 1994.
rules: 1. Look to the consumer, 2. Never lose the identity and character of the wine and 3. Emphasize elegant, food-friendly wines. Another modern Super Tuscan wine, the Il Pareto Toscana I.G.T. 2010, created from 100% cabernet sauvignon grapes, extracts flavors from the large amounts of limestone and gravel in the soils of the vineyard. It matures for 16-18 months in new and old oak, then another six months in the bottle. The wine has a classic cabernet bouquet of black fruits, vanilla and earth. The flavors are rich and jammy on the palate with some acidity on the finish that makes it food friendly. The “Il Parento” is, vintage to vintage, rated at the mid-nineties level. 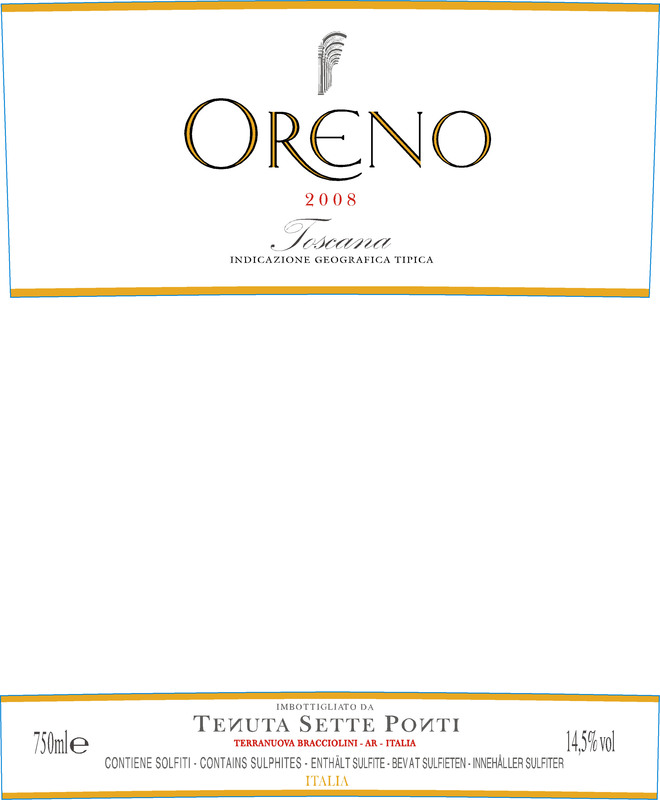 Named for the river that flows through the vineyard, the Oreno Toscana I.G.T. 2011, the flagship wine from Tenuta Sete Ponti takes Super Tuscan to a new level as a Bordeaux blend whose vintages have been ranked within the top ten wines in the world. From unique Tuscan soil blending clay, sand and limestone, the “Oreno” blends merlot for finesse, cabernet sauvignon for strength and petit verdot for the elegance that defines the wine, my favorite of the tasting. fermentation in open-air tanks, the wine ages in French barriques (large barrels) for 18 months before another 12 months in the bottle. The 2011 vintage, while quite young, has spicy aromas of dark fruit and definite touches of chocolate that govern the nose and palate. Expressing lithe tannins, this full-bodied wine will, most likely, emerge into something very special. Named for a small valley in the Veneto/Valpolicella area purchased by the Boscaini family in 1772, Masi Agricola owns the best terroir in northeast Veneto, including single varietal vineyards in six appellations throughout the region. Masi specializes in cru wines, each originating from a single vineyard. where the grapes are dried on bamboo racks before pressing, then fermented at very cold temperatures for weeks until all sugars turn to alcohol and the softening malolactic fermentation occurs. Production of the “Amarone” is extremely limited and made only in the best years. Each vintage spends three years in oak and another six months in the bottle before release. The 2001 vintage surely delivers as a bold, elegant wine with layered aromas of violets, dark fruits, spice and concentrated flavors of candied fruit on the palate. I would drink this wine with some strong Italian cheeses or by itself as an after dinner wine. The October 31st issue of Wine Spectator magazine features new wines from Tuscany in an article titled “Tuscan Bounty,” highlighting reds from Bolgheri, Chianti and other regions. 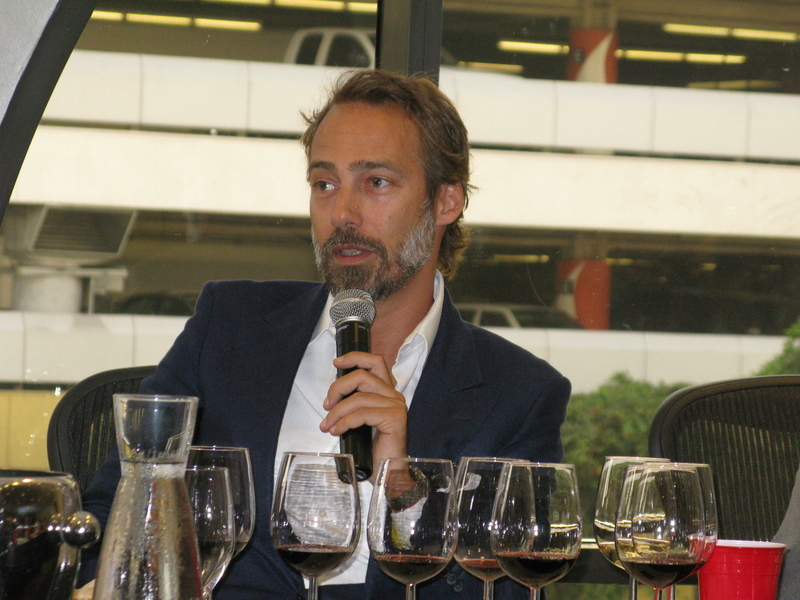 Among critic Bruce Sanderson’s recommended wines from Tuscany are the Tenuta San Guido Bolgheri-Sassicaia 2010 and the Tenuta Sette Ponti Toscana Oreno 2010, both awarded 94 pts with vintages featured at out tasting. While they are always subtle in describing their wines, these notable winemakers understand what they have. What was once intuition and tremendous risk is now sustainment, balancing the elements of each vintage with incredible terroir. 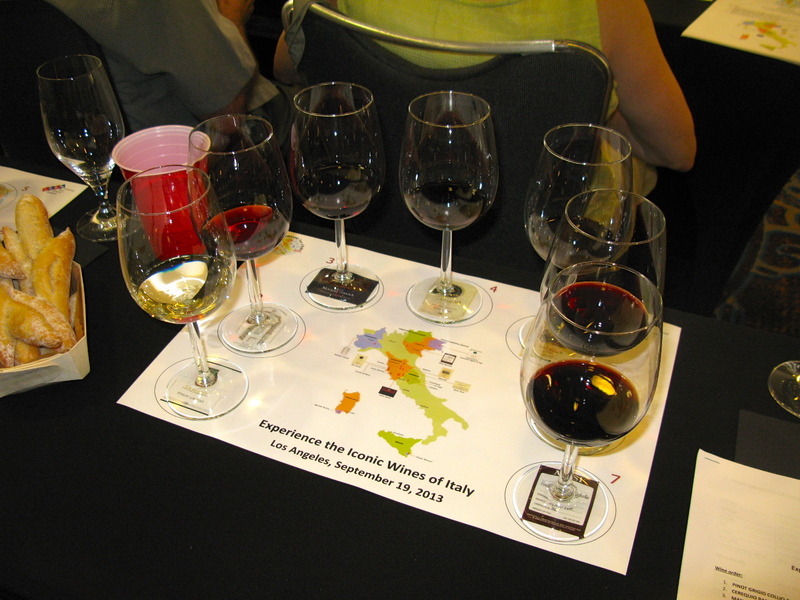 Italian wines are known for their character, appealing to some palates more than others. While the earthiness put forth from their soils is always evident, these wines are a blend of the best stock, terroir and viticulture, the stew of consistent greatness. This entry was posted on Wednesday, October 2nd, 2013 at 3:22 am	and tagged with Master of Wine, Super Tuscan, Tuscany and posted in Wine. You can follow any responses to this entry through the RSS 2.0 feed.